Syllabus of the Online Course (Subject): Inter-American Development Bank (IADB). Learning materials in or Banco Interamericano Desarrollo Banco Interamericano Desenvolvimento Banque Interamericaine. Description of the Online Course: Inter-American Development Bank. The Inter-American Development Bank (IADB) was created in 1959 as a partnership between nineteen Latin American countries and the United States. The Inter-American Investment Corporation is a multilateral investment institution that is part of the Inter-American Development Bank Group. Its mandate is the economic development promotion of its Latin American and the Caribbean member countries by financing private enterprise, preferably small and medium in scale. The Latin American microcredit portfolio grew by 35% a year, with the number of customers increasing by 25% annually. In 1999, the Inter-American Development Bank started using a nation grouping. This criterion divides countries into Groups I and II, based on their gross national product per capita. Furthermore, to these two groups, the Inter-American Development Bank has the mandate to devote at least 50% of its operations and 40% of its resources to programs that promote social equity and reduce poverty. The Inter-American Development Bank non-borrowing members include the United States, Canada, Japan, Israel, the Republic of Korea, China, and sixteen European Countries: Austria, Belgium, Croatia, Denmark, Finland, France, Germany, Italy, the Netherlands, Norway, Portugal, Slovenia, Spain, Sweden, Switzerland, and the United Kingdom. 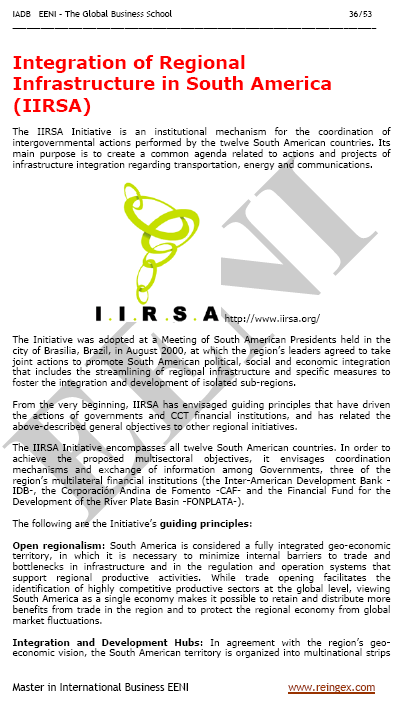 The Integration of Regional Infrastructure in South America is an institutional mechanism for intergovernmental coordination actions performed by the twelve South American Countries. Its main goal is to create a common agenda related to actions and infrastructure integration projects regarding transport, energy, and communications. 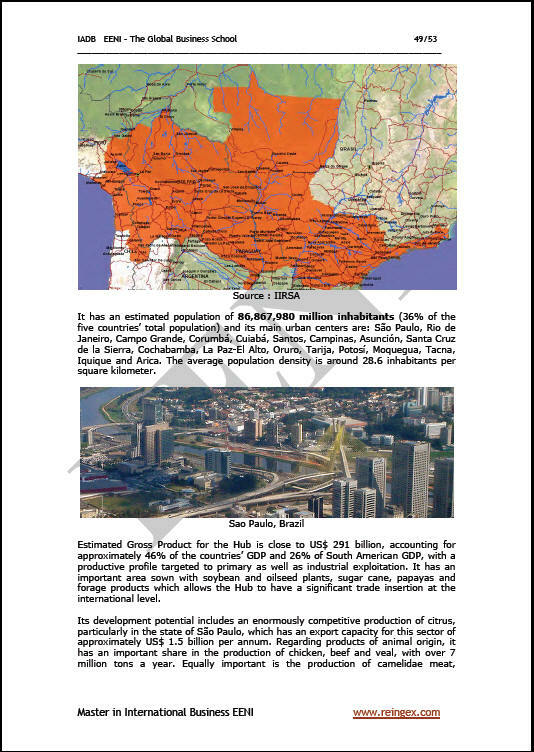 The integration and development hubs are multinational territories involving natural spaces, human settlements, production areas, and actual international trade flow. Infrastructure investments will create new opportunities for sustainable development for the population of these territories. 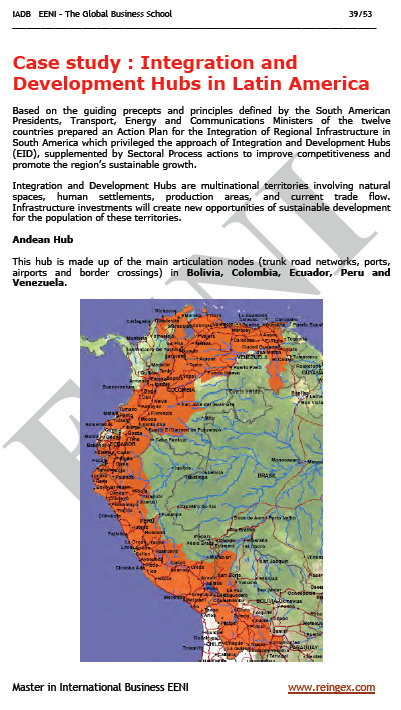 Integration and development hubs in Latin America: Andean, Southern Andean, Capricorn, Paraguay-Parana Waterway, Amazon, Guianese Shield, Southern, Central Inter-oceanic, the MERCOSUR-Chile, and Peru-Brazil-Bolivia. The Inter-American Development Bank Project Cycle. Each project the Inter-American Development Bank finances passes through a series of stages; principally preparation, approval, implementation, and termination and evaluation, known as the Project Cycle.